When a banquet dinner to celebrate my mother’s birthday was required, Elegance Chinese Cuisine, the restaurant we generally go to for dim sum, came to mind. 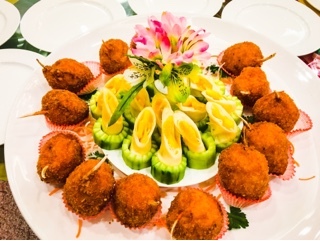 The restaurant is a gem, tucked in a quiet plaza so there’s plenty of parking during the dinner and the service attentive, not only during dinner, but throughout the entire process. From the moment I called in to make the reservation, Andy (their General Manager) was helpful at ensuring the menu was catered to meet our party size. The banquet meal I chose normally feeds ten ($668 inclusive of taxes and gratuities), but with the exception of three dishes where I added on additional pieces, the existing menu was more than enough to accommodate four extra people. Having located myself far away from the “serving station” and our server being so diligent at portioning dishes, most of the pictures within this post will be for the single serving. Sadly, they’re not photogenic, but hopefully provides you with an idea of the ingredients in each dish. The skin on the roasted suckling pig was divine, very thin and crispy so it could shatter with a light pressure. 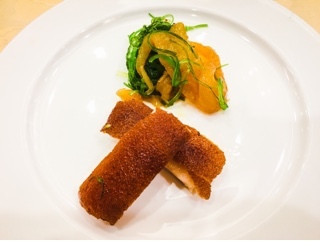 The warm pieces of juicy pork contrasted with cold marinated jelly fish and sweet seaweed salad. 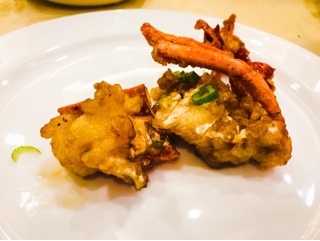 One of the large prawns in the seafood with vegetables plate was missing. Upon telling our server, they apologized and had it quickly supplemented (complete with an extra portion of vegetables) so the replacement dish wasn’t unadorned. 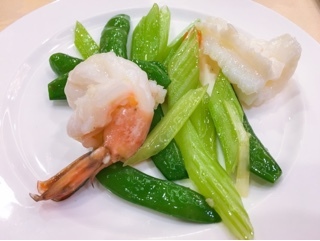 Both the prawn and squid was just cooked through and the celery and snap peas crispy and fresh. 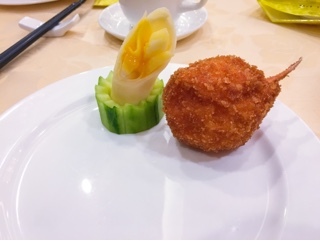 Interestingly, Elegance’s deep fried crab claw (hot, moist and a fair size) is each served with a hollowed out cucumber holding a mango and whipped cream filled crepe. They don’t exactly go together, but when eaten separately isn’t weird either. We all rather liked the early dessert in the meal. Normally, I wouldn’t order shark fin, but this came set in the menu. 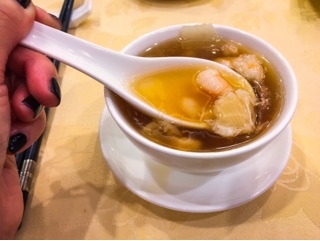 The braised shark fin soup was chocked full of minced seafood in the thick umami broth. 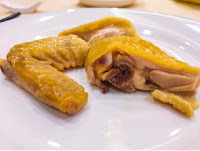 The whole abalone was delicious having been slowly braised to that it was infused with flavour. 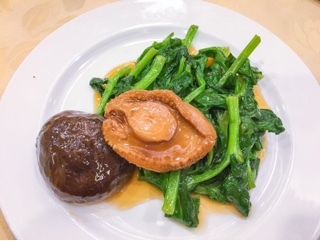 Trying to describe abalone to a family member, I’ve synthesized it to the steak of the seafood world – if you can imagine a tenderloin having a scallop and oyster twinge to it. 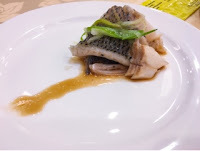 Both the steamed chicken with superior soup and steamed green bass were decent – cooked well so the moisture remains and not overly seasoned so the chicken and fish shone through. The lobster could have been stir fried a bit less as they were a little shrunken in their shells. But, the sweet and savoury Maggic sauce lightly coating each piece was tasty and not too overpowering. 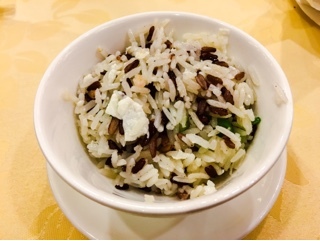 Elegance jazzed up the rice dish by mixing wild and jasmine rice together, giving it a pretty contrasting hue. Egg white, shrimp and diced Chinese broccoli completed the fried rice, but a bit more salt would help. 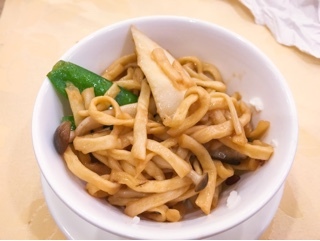 The braised e-fu noodles had plenty of mushrooms (enoki and prince) mixed into the oyster sauce laced spongy noodles. Slivers of snow peas help to add crunch and colour. 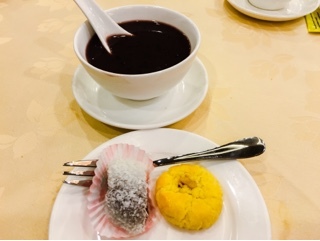 For dessert, a bowl of coconut black glutinous rice soup, which was surprisingly sweet for a Chinese restaurant. On the side were petit fours of chewy soft almond cookies and a sticky pastry filled with red bean paste and tossed in dried coconut. Since we were celebrating a birthday, we had to have an order of birthday buns (Elegance threw in on a complimentary basis). They were made fresh before dinner, arriving pillowy soft and filled with lotus paste – these were seriously the best birthday buns I’ve ever had. 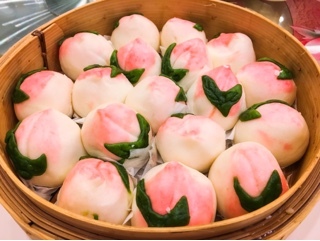 Each bun is shaped into a longevity peach, decorated with a pink dye and green flour leaves. According to Wikipedia, they’re supposed to represent the peaches of immortality, a mythical fruit produced every thousand years and grants immorality. What a great way to live eternally, dining on good food amongst family and loved ones.